Anime Profile: Katekyo Hitman Reborn! Last I checked, this anime was available on DVD at Amazon, and online at Crunchyroll. The above info came from Regina, and was edited by yours truly (contact me). The image came from Amazon. Anime Characters: Katekyo Hitman Reborn! Anime Description: Katekyo Hitman Reborn! An ordinary boy suddenly wakes up to find a baby as his new home tutor, who is supposed to train him to become the next boss of the Vongola mafia family! Will he survive the hardships ahead and become the boss, or will he just pass on, leaving the family on the road to ruin? Tsunayoshi "Tsuna" Sawada is hopeless! He cannot play sports he is not smart and he is the weakest person in his class, which has earned him the nickname "No Good Tsuna". The only thing that keeps him in school is his crush, the pretty sweet (and lets face it nun to bright) Kyoko Sasagawa. When he sees her with one of the upper class men, Mochida-sempai (as Tsuna calls him), he loses hope and goes home where his mother tells him how he SHOULD spend his life which is not how he's spending it. Tsuna could care less and more or less ignores his mother until she says she found a flyer in there mail box for a home tutor whom you don't have to pay just simply give him a place to sleep and something to eat. Tsuna finds this fishy and protest but it is to late his tutor has arrived. Reborn's his name and he's nothing more than a baby in a suit and fedora with a chameleon, named Leon, sitting on the brim. Tsuna laughs at him when Reborn says he is the home tutor and beats Tsuna up. Not long after Reborn fills Tsuna in the he is the great-great-great grandson of the first Vongola Family boss, Giotto, and that the other three candidates before him have been killed. Enrico being the first died in a gunfight. Massimo, the second in line, was found sleeping with the fishes and all that was found of the last, Federico was bones. Tsuna was freaked out and wanting to have nothing to do with the mafia family Vongola as he does for most of the series. Reborn is the top assassin the top mafia family in all of Italy, the Vongola's. He is the only one in the family with the Deathperation Bullets, that he shoots anyone he sees fit with (though this is normally Tsuna) the effects of the bullet are rather amazing. If the person that is shot with this bullet has regret, they will come back in the underwear only with the will to complete this. After 5 minutes the person will return to normal with no sign of ever being shot but still in there underwear. The bullet also seems to give the person shot with it super human strength and speed. It's also shown that if Reborn shoots a person some where else with these bullets it will greatly increase the abilities given from that area (as in Tsuna being shot in the knees gave him the ability to jump very very high) which suggest that for the person to have dieing will they must be shot in the head right between the eyes. Also, when a person is under dieing will they not only appear in there underwear but they also have a flame on there forehead, which shows they are under the effects of Deathperation. Later on Reborn shows these using them on Tsuna once to force him to confess to Kyoko knocking Mochida away and making Kyoko run away. Mochida then challenges Tsuna to a fight that Tsuna wins after being shot with deathperation. The first time the other shots were used during a volleyball game where Tsuna is shot in the knees giving him super jumping power and winning the game thus picking up his popularity. Not long after Gokudera confronts him claiming he should be the new air to the Vongola family heir he then attacks Tsuna with bombs but once again Tsuna beats him with Reborn's Deathperation bullets. Tsuna is now much more popular and with two friends, Hayato Gokudera and Takeshi Yamamoto, he is much happier but still hates the idea of being a mafia boss. The first big fight is between the Kokuyo Junior High Gang. Tsuna was highly freaked out but was determined to beat them do to the people that they have hurt (Ryohei who was in the hospital and Hayato who was hurt badly protecting Tsuna) they head off to Kokuyo Land where the gang is hiding out the first person seen is Ken whom Takeshi beats then M.M. who Bianchi takes down with ease. Not even ten minutes later Birds shows up treating Haru and Kyoko's lives by way of mass murder Twins Jiji and Didi. Bird's then tells them to beat up Tsuna and they all refuse save Bianchi who punches Tsuna with out hurting him to much. Then they are told to stab Tsuna or sulfuric acid will be poured on Kyoko's head. When they all refuse Tsuna takes the knife and just before he stabs him self Dr. Shamal saves Kyoko and older I-pin and Lambo save Haru (do to the Ten year bazooka of Lambo's they can switch places with there 10 yr future self for 5 minutes) Lancia was the last to be fought and he tells them he is not Mukuro as they thought. Finally, Mukuro is found and after a long battle and Tsuna's weapons upgrade they are defeated and are dragged of by the Vendicare, something like Mafia police. There is not a long peace before the Varia arrives trying to take the Vongola Rings that Basil brought not long before, luckily though Basil was given fake rings by his master Iemitsu, who is also Tsuna's father. Xanxus punishes Squalo for bringing these fake rings and the real fight begins a tournament of sorts to fight for the rings and the winner will be the next Vongola boss and Vongola ring guardians. While preparing for this Tsuna trains with Basil to fight Xanxus. The first battle is between Ryohei Sasagawa and Lussuria for the Ring of Sun. The battle is in a boxing ring with blinding lights above them. Lussuria has an upper hand in this though because he has glasses and after a little bit of a beating Ryohei defeats Lussuria, grabs Lussuria's half of the ring, and puts it with his showing he is the holder of the Run of Sun. The second battle is between Levi A Than and Lambo for the Vongola Ring of Thunder. Lambo is beaten to the point that he must shoot him self with Ten Year Bazooka twice summoning his 25 year old self and is still beaten. Just before he is killed, Tsuna steps in and causes Levi A Than to be called the winner of this battle and for Tsuna to lose his ring for intruding making it 2 to 1 the Varia having two and Vongola having one. The third battle is between Belphegor and Hayato for the Storm Ring. With the Cervello bringing in machines which blow hurricane force winds. There fight is the only fight that has a time limit. Belphegor seems almost beaten many times in this fight but never truly goes down for the count only getting more and more crazy as the fight continued. Eventually time is up and bombs attached to the hurricane turbines are set to blow up. Gokudera and Belphegor are fighting on the ground for the ring when Tsuna yells at Gokudera that it is not so important that he should lose his life and he returns living the ring to Belphegor. The 4th battle is between Takeshi Yamamoto and Superbia Squalo and is actually a rather quick battle where water is rising while Squalo and Yamamoto fight eventually a shark was released but nether noticed Squalo was beaten and refused Yamamoto's help to get away from the gigantic shark when he refuses Takeshi is forced to leave him and he is eaten by the shark. Making Yamamoto the rightful holder of the Ring or Rain. The fifth battle is between Mammon (or really Viper) and Chrome Dokuro (who shares a body with Mukuro) Chrome is no match for Mammon until Mukuro takes over appearing as a boy instead of as Chrome and defeating Mammon easily taking the Ring of Mist. Kyoya Hibari and Gola Mosca's battle is the last before the final fight. Hibari takes down Gola Mosca with one strike and goes after Xanxus not noticing Gola Mosca going berserk and attacking everything. By this time, the battle for the Cloud Ring is over due to Hibari possessing it so when Tsuna steps in to defeat Gola Mosca it is not counted against him. However, the ninth is revealed to be the power supply to the evil machine. Xanxus then begins to talk of how Tsuna struck the ninth down in cold blood but when the ninth wakes, up (seriously injured), he says it is no ones fault but hid for not being able to defeat Xanxus when he kidnapped him. Therefore, this only further strengthens Tsuna's resolve to stop Xanxus claiming the he does not want to be the 10th boss but he diffidently would not allow Xanxus to walk in the 9th's footsteps. The final Battle for the Ring of Sky comes around and all of the guardian's have been poisoned. It is the Sky guardian's job to defeat there opponent and they retrieve the ring from atop a large tower like structure and push it in to the bracelet like device on the guardian's arm to trigger the antidote to the deadly poison they were all given. During there battle Xanxus gives Levi A Than and Belphegor there rings so they can take out the rest of the Vongola Guardians. Meanwhile Hibari saves Himself and being the only cloud guardian there (Gola Mosca was a robot so it wouldn't have effected him even if he hadn't been smashed to bits) went after Belphegor knocking his ring up to Gokudera so he can heal himself. While Hibari and Belphegor fight Gokudera runs off saving a already critical Lambo from Levi A Than and then from the poison then goes on to save Chrome bumping into Yamamoto who Hibari gave his ring to after Belphegor ran from the fight saying he would love to continu e but had to do something else which was surely an excuse for being afraid of Hibari. Not long after Ryohei and Chrome are saved. Chrome from Belphegor, Mammon, and Ryohei from the poison. After a long and tiring battle, Tsuna was able to copy the event from the Cradle Affair (which was learned about during this fight) and use d the Zero Point Break Through freeze Xanxus. Thus, the Battle was one and the Vongola Family became the rightful airs to the Vongola Rings. 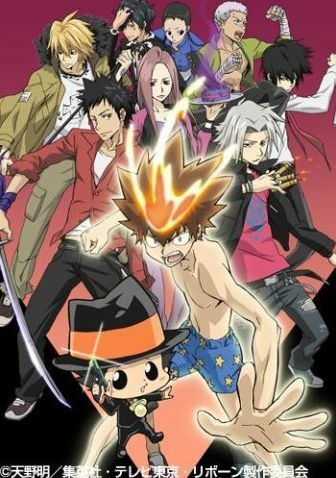 A couple of days after a party that was held for there winning (under the disguise of being for Lambo getting out of the hospital since the Mafia is being hidden from Haru Kyoko and Nana) Reborn is hit with the ten year bazooka but no older Reborn shows up in five minutes younger Reborn doesn't return Tsuna and the rest look for him and eventually Tsuna decides to go to the future to look there. When he arrives, he is in a coffin showing the future Tsunayoshi Sawada is dead. Not long after Hayato shows up as a 25 year old and explains a small amount of what is going on but before much is said, his past self shows up. They then are attacked by Lal Mirch who find out who they are and takes them away where they find more enemies along with meeting older Takeshi, Haru, Kyoko, Lambo, and I-pin who not long after return to there younger selves. It then becomes evident they will not be returning soon and they defeat there enemies with help of devices called Boxes which react to there fl ame and create a weapon for them. They defeat there enemies and return to the base where they find Reborn is also dead in the future as are all of the acroblanco except for Lal Mirch. After many descending events as in Hibari training Tsuna and him going thought the Vongola Trial something all bosses must face but none have faced so young. Tsuna finds the bloody and horrible truth of the Vongola family and says he would rather destroy the Vongola's than except it even thought he agrees in the end. Also Chrome in her younger forum is brought after fighting Glo Xinia and do to Mukuro's "death" (it's unknown yet if he really is even though Glo says he killed him you never really know with Mukuro) her organs are failing but Hibari stops her and forces her to create her own by giving her more power. Lastly, Gokudera's Past is reviled by Reborn and his sister but he still struggles with his training. Along with a message, arriving from Older Belphegor and Squalo saying for them to stay put and further instruction will come latter. The above description came from M.R.K. and Regina, and was edited by yours truly (contact me).